To "stock" a dungeon means to fill in general details, such as monsters, treasure, and traps. Special monsters should be first placed in the appropriate rooms along with special treasures. The remaining rooms can be stocked as the DM wishes. If there is no preference as to how certain rooms are stocked, the following system may be used. There is an elegance here that belies the image of random tables being random and chaotic. Using this system, and a couple of sub-tables utilizing a d6, one can create a unique feel for any dungeon map. Keeping each small table within a theme creates the sense of an ecosystem. Since each table has a maximum of six entries, it takes very little effort to create. 1. It saves time. As a Referee I don't have to worry about stocking everything in a huge mega-dungeon. 2. It makes the dungeon extremely portable and recyclable. I can use the same dungeon several times and have it be different each time. When players clear out a level, restocking is not much of an issue. 3. It is as much an adventure for the Referee as it is for the player. I get to have the fun of seeing my dungeon develop in an organic way through the interaction of my concept, the players and some dice. The lesson here is that random tables are only as crazy and chaotic as you allow them to be. When tightly controlled, they are an invaluable tool. Despite the fact that I have played Champions more than any other RPG except for D&D, my favorite superhero RPG of all time is Villains and Vigilantes. The reason is simple: I love the random tables for character generation. In fact, all my best characters in Champions found their genesis in those tables. Like many who prefer the ways of the old-school, I embrace the chaos of the random table. Meticulously plotted adventure paths are extremely time consuming. Even if you've shelled out your hard earned money to pay someone else to do it for you, if you are going to Referee the thing, you have to spend several hours reading over everything to make sure that you are prepared. In contrast, with a good wandering monster table, a treasure table, and a map, you can be ready to DM in minutes. This is a particular blessing when players decide to take your carefully constructed plot and throw it out the window by doing something unpredictable. Once you've established a few things from the tables, you can use your time far more efficiently to come up with reasons why the world is the way the tables says it is. In the end, you'll have a story that not only didn't put an unnecessary burden on your time, but was primarily put into motion by your players. 2) "Assuredly, I say to you that this poor widow has put in more than all those who have given to the treasury; for they all put in out of their abundance, but she out of her poverty put in all she had" (Mark 12:43-44). A priest once quoted this piece of scripture in response to the radical inequality and injustice that exists in the world. It isn't the hand that you are dealt that matters, but, rather, how you play it. The poor widow was dealt a really crappy hand, but she played it brilliantly. In other words, random tables will test your ability as a player. Both Referees and Players will have to apply all their skills in order to make the result of the die make sense. In the end, the die result isn't what matters, but rather what you do with it. A player who can make magic with a weird result from a random table is a better player than one who refuses to make the roll. Please note: I do not advocate being a slave to the die roll. On the contrary, using random tables takes skill and there are times and results that push my own abilities beyond their limits. On countless occasions I have thrown out results because I could not see a way to make them work. However, these unworkable results inevitably are a catalyst for ideas that I would never have thought of otherwise. Over on Grognardia, James has thrown down a gauntlet, of sorts. I'd like to take up that gauntlet and meditate on a few aspects of what I consider to be old school. 1) What makes a Fighting Man a Barbarian, a Knight, or a Gladiator is the way it is played, not the mechanics behind it. Old school games rely heavily on player skill, imagination, and creativity. The mechanics are meant to be a spring board for player to do what ever they want. In contrast, newer school games define classes (or whatever they might be called) by the mechanics themselves. This may have the illusion of player skill, imagination, and creativity; however, when mechanics define a character, there is always certain mechanical paths that are going to take advantage of the system better than others. Thus, imagination and creativity are actually stifled, not encouraged. For Example: Champions seems to have old school credentials, given that it was originally published in 1981. However, I do not classify it as an old school game. One reason for this is that mechanics entirely define the character in Champions. My character may be able to produce fire, but unless I've bought a power that allows me to either raise the temperature in an area or light up an area, my character can do neither of these things. In addition, virtually every character I ever created for Champions (and I played a lot of Champions) had a Dex of 23. Mathematically, this was the most efficient Dex a character could have, and it was just too expensive to do anything else. For Example: In 3.5, Bards have the class ability Bardic Knowledge. They roll and are able to learn a random bit of info about a particular aspect of their game world. If a Bard has the skill Knowledge (History) with five ranks or more, the Bard receives a +2 on Bardic Knowledge rolls. This mechanically punishes players who want to have Bards with other specialties and virtually guarantees that every 3.5 Bard is going to have five ranks of Knowledge (History). 2) The longer it takes to create a character, the heavier the mechanical burden exists in a game to prevent character death. Old School games are comfortable with character death. I've written on this before. One reason for this is that characters are so easy to create, that one doesn't have to spent a lot of time out of game to replace the dead character. Sometimes, it is as easy as taking over a henchman. In contrast, games that require a lot of time in character creation balk at having players have to go through that effort again. For Example: In Champions, it is very difficult to die. Every character has both Stun and Body. The vast majority of attacks can only penetrate standard defenses to do Stun, not Body. Thus, the end of combat results in unconsciousness, not death. For Example: 3.5 has Challenge Ratings. Every encounter is rated to help guarantee the players will not get in over their heads. The word "angel" itself means messenger, and they are also known by the title "the bodiless powers." Thus, they are part of the invisible creation. In his pride, the Devil sought to be greater than God. He tried to wrest power from God by by destroying the image of God in humanity. He first tried to destroy the relationship of God and humanity through tempting Adam and Eve to eat the fruit. Then he tried to destroy humanity's relationship to itself by tempting Cain to murder his brother Abel. Though he ultimately failed to destroy the image and likeness of God within us, he did succeed in introducing sin and death into the world. In so doing, he gained control of humanity through death and sin. he knows where the Old Ones broke through of old, and where They shall break through again. He knows where They have trod earth's fields, and where They still tread them, and why no one can behold Them as They tread. The Old Ones become a cipher for the fallen angels that the Devil took with him in his rebellion. They broke through when humanity turned its back on God, and they strive for control of creation — a task they can never succeed at because they are part of creation. God, who is by nature something completely other than creation, sustains creation by His will. The irony is that without God's will, creation will return to the nothingness from which God created it — should the Devil and his fallen angels ever succeed in wresting complete control from God, they will cease to exist. There are also Gnostic overtones with the description of Yog-Sothoth. Gnosticism is a heresy that claims that the creator God is really a selfish and evil demiurge that has trapped the true essence of human beings in creation. Only through "secret knowledge" does one discover their "true nature" as a spark of the "true god." One aspect that I love about Lovecraft's description of the "secret knowledge" of the Old Ones is that it leads to insanity — a fair description of anyone who willingly chooses nothingness over the eternity of life that God offers His creation. Thus, Yog-Sothoth and the secret knowledge he offers is the patron of the forces of Chaos that inhabit the wilderness of Erimia. This is a map for the caves from the Southern Ruins for the Erimia campaign. Please note: Glue Flowers and Ant Horrors can both be found in Mutant Future and Ranine are the creation of James Maliszewski. 1. A patch of rather large, phosphorescent Glue Flowers  (HP 14, 13, 11, 9, 9, 9, 6; #AT: 1 (glue); D: special; AC 9; Morale: n/a; MV: none) grow here. Adventurers must take great care to avoid the flowers or be attacked. 2. This cavern has a slight upward incline and is covered with a snot-like substance. While being completely disgusting, the substance is seemingly harmless when touched, tasted, or otherwise interacted with. However, the slime produces a tasteless and odorless poisonous gas. After 1d10 rounds of continually being in the cavern, adventurers must save vs. poison every round or lose a point of Constitution. These losses may be recovered by leaving the cavern and breathing non-poisonous air continuously for an hour. If an adventurer's Constitution reaches 0, they fall unconscious. If they are not removed from the poisonous gas for a number of rounds equal to their Constitution, they will die. 3. Within the walls of this cave is a rich vein of precious stones. Each stone takes 1d6 turns to extract and is worth 1d10x10 gp. However, the poisonous gas from Area 2 pools here. All saves vs. poison are at -2. 5. This cavern has a slight upward slope and is covered in the same slime as Area 2. However, the floor of this cavern is very thin. Any adventurer who steps into the cavern will fall through the floor, falling 10 ft. Note:The whole floor will not give way —it only breaks where an adventurer steps. 6. This is the web-covered lair of a pair of Giant Crab Spiders  (HP 10, 8; #AT: 1 (bite); D: 1b8, poison; AC 7; Morale: 7; MV: 120(40)). There are several desiccated corpses which were former victims of the spiders. One has a large sack with 200 sp. 8-10. 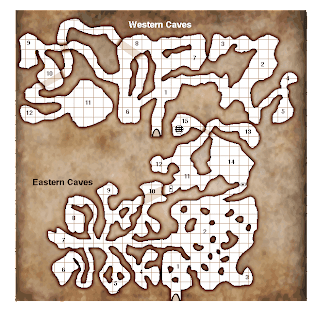 These caverns are a teeming colony of Giant Rats [d10] (HP 4, 4, 3, 3, 3, 2, 2, 2, 1, 1; #AT: 1 (bite); D: 1b3, disease; AC 7; Morale: 8; MV: 120(40)). Each cavern will always have rats in them, no matter how many times the adventurers clear them out. For each encounter, there is a 1 in 6 chance that the rats have a Minor Chaotic Trait. 11. This is the lair of an Ant Horror  (HP 22; #AT: 2 (bites) or 1 (tail); D: 2d8/2d8 or 1d10+poison; AC 3; Morale: 7; MV: 150(50)). 12. The entrance of this cavern is partially blocked. Human-sized creatures can squeeze past, but the Ant Horror cannot. In the cave is the body of a Ipolian soldier. He wears platmail armor, a shield, a spear, short sword and silver dagger all in good condition. within the remains of a sack are 5 gems worth 100 gp each. He also wears a jeweled badge of rank worth 300 gp. Note: these items will be easily recognized by the citizens of Gate and difficult to sell there. 1. This is the lair of a Chaos Beast  (HP 19; #AT: 1 (bite) + gaze; D: 1d10; AC 3; Morale: 9; MV: 90(30)). This emaciated, beaked, serpentine horror is perpetually hungry and will attack anyone in the vicinity of the caves. Its gaze causes a breakdown of a person's ability to make sense out of reality. Adventurers who meet the beast's gaze must save vs. petrification or lose 1 Int. Adventurers who wish to completely avoid the gaze cannot attack. Any attack made trying to avoid the gaze is at -4 to hit and still has a 1 in 6 chance of meeting the gaze. Normally attacking will result in meeting the gaze on a 1-3 on a d6. Seeing the creature from afar has a 4 in 6 chance of meeting the gaze. All Int loss is regained after an hour. Anyone who is reduced to 0 Int becomes mindless and is unable to do anything. The Chaos Beast will not attack mindless adventurers, rather, at the first opportunity will drag them into Area 2. 2. This is a birthing chamber for the Ranine. Mindless victims are are chained to rock columns, seeded with eggs, and serve as the first meal for the Ranine young. The Chaos Beast feasts on the weakest Ranine, leaving the strongest to join the Ranines in Areas 11-15. At any one time, there are 2d6-2 mindless chained to various columns throughout the cavern. 3. Chaos energy has created a soft spot in space here. Anytime adventurers enter this cavern, there is a 1 in 6 chance that they are teleported to anyplace the DM wants. 4. This is a trash heap where the Ranine throw the bones that remain from the victims of the Chaos Beast. Thousands of bones are here, all tainted by Chaos. Any time adventurers enter this cavern 3d4 misshapen and mismatched skeletons will animate to take revenge on the living (HP 6 ea. ; #AT: 1; D: 1d6; AC 7; Morale: 12; MV: 60(20)). Scattered throughout the bones are 1500 cp, 200 sp, and a potion of healing. 5. On each of the two rock columns in the middle of this cavern are carved a mockery of a mouth. When asked a question, they answer. One will always tell the truth, the other will always tell a lie. However, which one does which is determined at every question by a die roll. 7. A number of chain and cuffs hang from the back wall of this cavern. The Ranine will go on hunting parties to capture victims for the Chaos Beast. Their prisoners are chained here, awaiting the Chaos Beat to eat them or render them mindless. At any time there are 1d4-1 creatures chained to the wall here. 8. This is the lair of a Ghoul  (HP 12; #AT: 3 (2 claws, bite); D: 1d3/1d3/1d3+paralysis; AC 6; Morale: 9; MV: 90(30)). It wears a bracelet and a necklace each worth 400 gp. 9. There is a carving in the wall of this cavern that depicts a star that falls from the sky and is now buried beneath a mountain. 11. Ranine  (HP 21, 13, 5, 4; #AT: 3 (2 claws, bite); D: 1d6/1d6/1d4+paralysis; AC 4; Morale: 8; MV: 90(30)). The largest (21 hp) is a 4 HD creature and the one with 13 hp regenerates 1d4 HP per round. 12. Ranine  (HP 9, 9; #AT: 3 (2 claws, bite); D: 1d6/1d6/1d4+paralysis; AC 4; Morale: 8; MV: 90(30)). 13. Ranine  (HP 9, 8; #AT: 3 (2 claws, bite); D: 1d6/1d6/1d4+paralysis; AC 4; Morale: 8; MV: 90(30)). 14. Ranine  (HP 10, 7; #AT: 3 (2 claws, bite); D: 1d6/1d6/1d4+paralysis; AC 4; Morale: 8; MV: 90(30)). 15. Ranine  (HP 9, 7, 5, 3; #AT: 3 (2 claws, bite); D: 1d6/1d6/1d4+paralysis; AC 4; Morale: 8; MV: 90(30)). The largest (9 hp) may cast darkness (30' r.) at will and wields a magic short sword. It functions as a +1 magic weapon, but when wielded in combat it makes micro tears in the fabric of space and time. This has two side-effects: 1) All monsters and henchmen sense that something is terribly wrong and are -2 morale; 2) Every time a 20 is rolled when attacking with the weapon, a larger tear is made and there is a 1 in 20 chance that something horrible crawls through. If a know alignment spell is cast on the blade, it will register Chaotic. There is a well here from which can be heard the sound of rushing water. This can be an entrance into a sub-level or a lower level of the dungeon below. There is a locked chest wedged into a recess in the wall. It contains 1000 gp. and 200 pp.